Teams have been adopting exhaust blown diffusers (EBD) since last year and in 2011 every team has exploited the exhaust to some extent to help drive airflow through the diffuser. 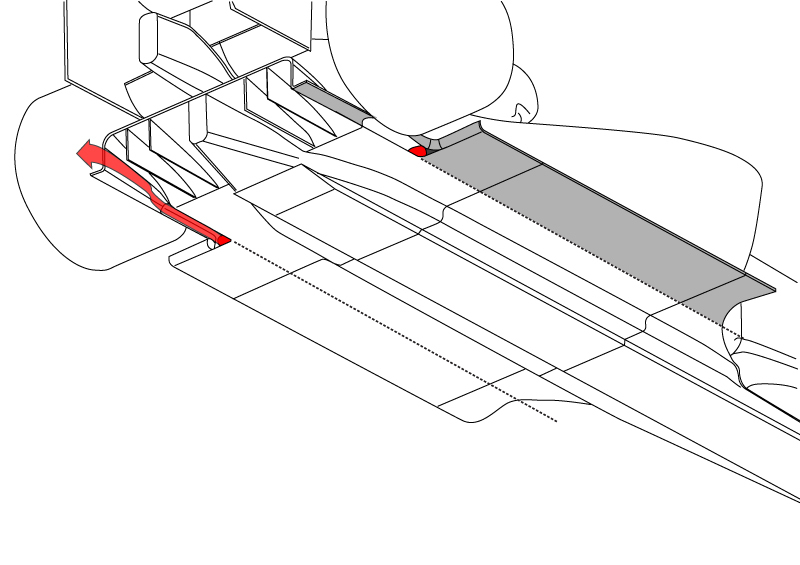 As I have explained in previous posts on the subject (https://scarbsf1.wordpress.com/category/exhaust-driven-diffuser/), the problem with EBDs is that they create downforce dependant on throttle position, so as the driver lifts off the throttle pedal going into a turn, the exhaust flow slows down and reduced the downforce effect, just at the point the driver needs it for cornering. If a team want to really exploit the benefits of an EBD then they need to resolve this off-throttle problem. Last year Red Bull exploited a different mapping of the engine when off throttle (see https://scarbsf1.wordpress.com/2010/07/10/red-bull-map-q-the-secret-to-the-teams-q3-pace/ ). By retarding the ignition when the driver lifts off, the fuel is no longer burnt inside a closed combustion chamber, but instead the fuel and air burn in the exhaust pipe, the expandign gasses blow out of the exhaust exit as though the engine is running . This creates a more constant flow of exhaust gasses between on and off throttle. The problem here is that the mapping uses more fuel and creates excessive heat in the exhaust pipe and at the exhaust valve. Renault reported that both Red Bull and Renault used 10% more fuel in Melbourne compared to last year, most likely due to these off-throttle mappings. As the engine suppliers have become increasingly comfortable with the heating effect of these off throttle mappings, teams have been able to use more of this effect in the race. One of Red Bulls advantages this year according to McLaren is their use of aggressive engine maps for downforce. At the Turkish GP several people pointed out the engine note on the overrun on Alonso’s Ferrari during FP2. Teams have clearly started to drive the engine quite hard when off throttle, to keep the diffuser fed with a constant exhaust flow. Now the FIA have stepped in to limit this effect. Although initially scheduled to be in effect from this weekends Spanish GP the change will now take effect after Canada. This clarification is based on Charlie Whitings changing opinion of how these mappings are used. At first some mapping was allowed, but these increasingly aggressive and fuel hungry mappings are changing the engines primary purpose. Effectively when off throttle the engine is being used purely to drive the aerodynamics, this contradicts the regulation on movable aerodynamic devices. Although this is a vague interpretation it can be justified. What is now required is that the engines throttles (at the inlet manifold) must be closed to 10% of their maximum opening when the driver lifts off the throttle pedal. Unlike in most road cars, in an F1 car the engines throttles are not under the direct control of the driver via the pedal. The throttle pedal is instead the drivers method to request power\torque, the cars SECU then controls the level of throttle required to meet the drivers request. So as the driver lifts off the throttle pedal, he is no longer requesting power\torque and therefore the throttles should close. what happens with these EBD mappings is that the throttles remain open, Fuel continues to flow then the delayed spark from the plugs sends the burning charge down the exhaust pipe. Now with the throttle closed to 10%, the amount of fuel that can be burnt will be limited and thus the blown effect will be reduced. so drivers see will a bigger variation in downforce as they modulate the throttle pedal, making the car less predictable to drive. All teams will be affected to some extent, however the more aggressive that teams have been with the exhaust position relative to the floor, then the greater they will be affected. From the start of the season Red Bull, Ferrari and McLaren have blown the exhaust at the outer 5cm of diffuser. 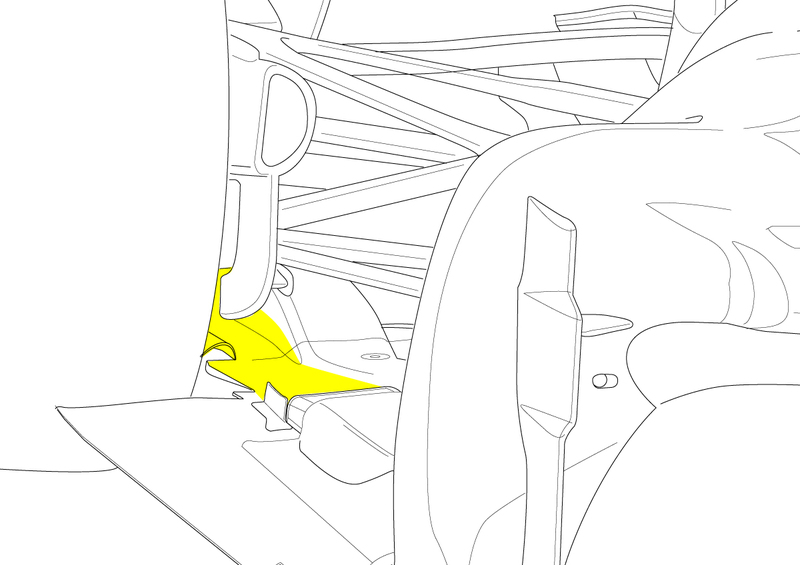 this area is allowed to to be open and bow the exhaust gas under the diffuser for greater downforce. these designs will be most greatly affected by the clarification. Renaults Front Exit exhaust is also likely to be a victim of the change. Many teams have been developing Red Bull Style outer-5cm EBDs, such as: Williams, Lotus, Virgin, Sauber, While Mercedes are rumoured to be adopting a front exit exhaust. These may to need be shelved after Canada, in order to employ a less aggressive EBD. This entry was posted in Exhaust Driven Diffuser, F1 2011 by scarbsf1. Bookmark the permalink. Surely springing a surprise change in regulations which will require major redesigns of 90% of the cars on the grid is completely contradictory to the FIA’s own commitment to reduce spending in F1? Is it possible to do the opposite of an EBD say a Negative EBD where the diffuser becomes less effective when blown and reduces down-force and possibly increasing straight line speed? Or would this simply not work/be illegal? I must admit that I was a little disappointed that the FIA backed down from imposing this change immediately. I think the consequences would be fascinating. A lot of road cars now use drive-by-wire throttle pedals. They’re easier to place and easier to route electronic cables than mechanical throttle cables, generally more reliable and it allows the ECU to optimize fuel economy and drivability. I believe Ford introduced drive-by-wire on the original Focus C-Max in 2004 and then adopted them on the Mk2 Focus in 2005. Toyota have had a lot of trouble over the last year with ‘unexpected acceleration’, which – because they are drive by wire – kicked off an investigation by NASA into the electronics and software. Toyota have recalled cars for sticking throttle pedals and floor mats fouling the pedal. A quick observation; I commute 90+ miles each day on very flat, boring highway. I never had a working cruise control growing up so I don’t use them now, but I am quite good at maintaining a constant speed. Anyway, I talked to our local dealer techs and to Toyota about issues with ‘unexpected acceleration’ because I have noticed that my car will very subtly accelerate and pick up a few mph. Then, a few minutes later, will very subtly decelerate and loose a few mph. A passenger might not notice it, but when you spend 1.5 hours a day in your car, you notice it. It’s just a sudden gentle push, or gentle brake. Just enough to make a relaxed head rock backward or forward. I mentioned this to them about three years ago. Even took a tech for a ride along who said they could feel what I was talking about, but said it was/is not an issue. Luckily, my car has standard transmission, so even if the car took off I could just drop it into neutral. BMW’s 850i, introduced in 1991, had throttle-by-wire on the M70B50 V-12 engine. I owned one for 11 years and never had any trouble with it. There were two “DK Motors” that that controlled the throttles, one for each cylinder bank. If one bank had a problem, the car could downmode to “limp home mode,” and run on six cylinders. Pretty high tech stuff for a production car built 20 years ago. Electronic throttle control (ETC) has been around for a long time. Even my 2002 BMW E46 325ci has electronic throttle control. Could the teams no change the software so that as the brake is pressed the engine is retarded?So if the driver goes into a corner with his foot still flat on the throttle but on the brakes, the throttle position is open so maximum exhaust flow is allowed. So then if the drivers foot is off the throttle – the engine throttles must be at minimum, no? They forgot to include “respectively.” There’s your loophole. and well spotted kyle, another loophole realised! next thing drivers will be learning to hold their right foot flat while braking… insane. I wonder if there aren’t any regulations that prevent Ross D’s solution being legal. I vaguely remember (was it Williams? In the 90s?) the FIA banning brakesteering; which entailed balancing braking power to the left/right side depending on the position of the steering wheel. The basis on which that was banned might also apply to this situation. how do they plan to enforce this? I really didn’t know that the flow was “re-enforced” with the fuel combustion. I quite liked Ross D’s idea, but that doesn’t solve the issue of shutting the throttle down to 10%. I guess a team could have a massive manifold so the 10% was the maximum it actually needed, but the throttle could go up to the daft full 100% for the scrutineers tests. Still do not think that would work, seeing as I am not too familiar with the intake manifold regs. Good post. Now I cant wait to see what the teams come up with next! What worries me the must is the sudden rule change,the cars dynamics is based around this induced aero effect. Because of this massive jet of air flow build into back of the car.The bottom trays are longer and wider in respect to the side pods. Even though the side pods have a boat hull shape to induce a seal mid way,air drag under the car can be slowed by a huge amount, causing lift. Gordon Murry explained the problems of the BT-55 long flat bottom and though he did not relate it to Elio de Angelis crash at Paul Recard,He did say that there was issues with the car stalling aerodynamically.I realize different times and different tech but it could cause a car to go vertical while passing.There is a great cause for concern,the engineers are right.And if it happens in Italy, God help them. I hate to be a BLOGG HOG,but if a car goes sideways that driver is going up in a big bad way!Theres nothing going to keep him pinned to the track.Clip a curb at 160 mph or get sideways at 140 and he is gone, long gone. Change the name from formula one to frisbee one.